In bonds, the Market Climate remained characterised last week by modestly unfavorable yield levels and hostile yield pressures. The Strategic Total Return Fund continues to carry a duration of about 4 years, mostly in intermediate term Treasury notes. My near-term concern continues to be the risk of fresh credit strains. As we observed in 2008 and early 2009, the likely outcome of such credit strains is a flight-to-safety toward default-free Treasury securities (a flight that tends to outweigh supply concerns over the near term), and a tendency toward dollar strength and commodity weakness. That said, the long-term implications of bailouts, tax shortfalls and lack of budget discipline is likely to be significant inflation pressure beginning about 4 years or so out, and continuing for the remainder of the decade. The chart below provides an effective reminder of the situation. It should not escape investors that the rapid expansion of deficits during the 1970’s and into the early 1980’s was accompanied by a hostile inflation climate, while the fiscal discipline of the 1990’s produced a very pleasant period of low inflation pressures. Inflation is always and everywhere a fiscal phenomenon. Though hyperinflations are typically driven by the inevitable financing of fiscal deficits by money creation, you will not find sustained inflation without sustained fiscal irresponsibility. 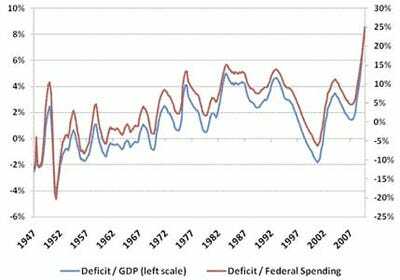 As Peter Bernholz notes in Monetary Regimes and Inflation, “there has never occurred a hyperinflation in history which was not caused by a huge deficit of the state.” While we certainly don’t anticipate anything on the order of hyperinflation, the expansion in deficit spending that we currently observe is beyond anything ever observed in the post-war era. I continue to anticipate a near doubling in the CPI over the course of about 10 years, focused primarily in the latter half of this decade.